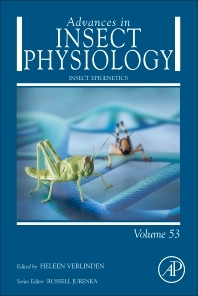 Margaret Beaton and Marcin W. Wojewodzic Sr.
Insect Epigenetics, Volume 53 provides readers with the latest interdisciplinary reviews on the topic. Updated chapters in this new release include Epigenetics in insects: Mechanisms, ecological outcomes, and evolutionary consequences, Nutrition and epigenetic change in insects, microRNAs in Drosophila insulin regulation, Epigenetic regulation of longevity in insects, Epigenetic influences on diapause, the Impact of parasites on epigenetics of their insect hosts, The molecular physiology of locust swarming behavior, The future of environmental epigenetics: insights using the clonal water-flea model, and. Epigenetics – A hidden target of insecticides. Led by volume editor Heleen Verlinden, this is an essential reference source for entomologists, zoologists, geneticists and insect chemists. Dr. Russell Jurenka is a professor in the Department of Entomology at Iowa State University. Heleen Verlinden is Postdoctoral Fellow in the Research Group of Molecular Developmental Physiology and Signal Transduction at KU Leuven in Leuven, Belgium.